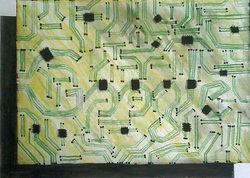 My doodle for Google is called Chrome Circuits. The theme was “My Invention”. I was one of seventy five in my group, picked for the semi-finals of the doodle for Google Competition, where I was in with a chance to win a €5000 college scholarship, a Chrome Book and €10,000 euro worth of technical equipment for my school. I came up with the idea because Google work with technology and recently released their laptop and tablet. Unfortunately I did not get to the finals but to even get to the semi-finals is an achievement of which I am proud and maybe I’ll enter again next year! Robert was successful in 2015 also. Click here for details.